Dental Inlays and Onlays are used to reconstruct teeth that are slightly to moderately affected by caries. They are also used in cases where the tooth is cracked or truncated, in situations where damage is not so high that a toothbrush is used. Most often they are made of ceramic, composite and gold. Dental inlays are used in cavities or cramps located on the upper surface of the teeth. They are dental colored, and are often used as a replacement for black amalgam fillings to achieve a better aesthetic of the teeth. Dental onlays are used in cases where caries involve a larger area of ​​the teeth and when it is necessary to compensate for the greater part of the toothbrush. 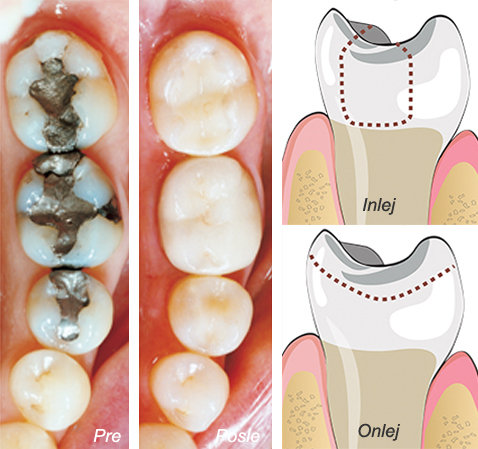 The setting of the inlay or onlay begins with the cleaning of the teeth and the removal of the caries. Then a print is sent which is sent to the laboratory where inlay or then is made from any of the mentioned materials. Until the next arrival at the dentist, the tooth is temporarily closed. When Inlays and Onlays are finished, they are carefully placed on the tooth and attached with strong resin. • They are made in the color of teeth and are almost invisible. • They are more resistant to temperature changes in general, so they can last 30 years or more. • They require much less grinding of teeth than ordinary seals. • Long-term preservation of damaged tooth, increasing its resistance and hardness up to 70%.